Working in the trade for about 28 years, Roy is self-taught. Moving to Pembrokeshire he opened a small gallery where his products are displayed. Inspiration is drawn from a wide range of sources particularly organic shapes, the beautiful landscapes and coastal views of West Wales. 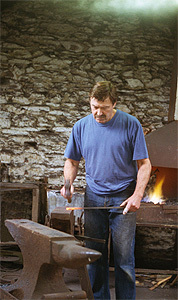 He is a member of the Pembrokeshire Craftsmen’s Circle, and exhibits regularly at their shows primarily in St David’s, Pembrokeshire. He also travels throughout U.K. to other shows.